MSCI, which is a product of Morgan Stanley (MS) and Capital International (CI), provides indices that focus on emerging market countries, developed market countries and various stock groups. For example, the MSCI EAFE Index is a benchmark designed to measure the performance of international stocks in developed markets outside the US. These indices are also used as the benchmarks for many ETFs and mutual funds. 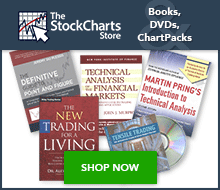 StockCharts.com users can access an up-to-date list of symbols for all our MSCI Indices. From this list, click the “Mentions” icon to the right of a specific symbol for more details about the symbol, as well as recent mentions in Public ChartLists, blog articles, and more.